What is a Wolfalike Dog? A Wolfalike (the noun being taken from the adjective ‘wolf-like‘) describes a dog (Canis Familiaris) intentionally created to be as close to the wolf (Canis Lupus) in appearance and characteristics as possible, while retaining mostly dog-like behaviours but no or negligible actual wolf content. For years people have been trying to create a Wolfalike dog to this specification. 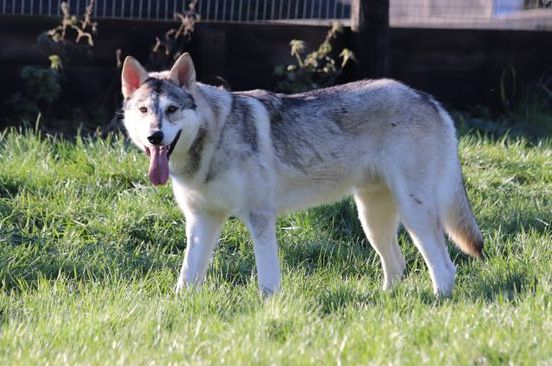 More familiar Wolfalike breeds might be the Northern Inuit Dog, The Utonagan and the Tamaskan - all of these were originally bred using the same founding dogs. The most popular breeds used in the foundation of the Wolfalike breed are the Siberian Husky, the Alaskan Malamute and the German Shepherd; traces of other breeds such as the Samoyed and Norwegian Elkhound and Collie have also been found in the genetic makeup of some Wolfalike dogs. You will find that some Wolfalike dogs do have a minimal amount of wolf content in them, but this is negligible. Some breeders have used The Saarloos wolfdog or the Czechoslovakian Wolfdog in their breeding programs. Because of people’s difference of opinions on how Wolfalike breeds should move forward, many breeders have opted to move away from the closed gene pool clubs and become independent breeders to better develop the breed and widen the gene pool by introducing other Wolfalike dogs. A Wolfalike can be large and athletic - or Giant and robust, some are similar in height and weight to the German Shepherd, others tower above the German shepherd and take on the Timberwolf stance. He or she should have a wolf-like appearance with a dense coat in the winter and a sleeker coat in the summer. The head should bear medium-sized ears and a characteristic “wolfish” mask. The tail should be straight and bushy. Everyone’s perspective of a wolf is different but the more similarities the individual has to a “standard” wolf in looks and movement the better. Wolfalikes are intelligent dogs, but, on occasion, might like to come across as less clever than they actually are- they love to learn and are really willing to please you, but they do lose interest and get bored easily, at which point they are likely to feign stupidity and forgetfulness! They are loyal and lovable companions with a wonderful temperament and make fantastic family pets. They get along well in a home environment with children and other an to introduce them when your dog is a puppy, so they will grow up together. Wolfalikes are, as a rule, pack animals and are therefore at their best kept together in a group. They can, however, be an only dog if you have the huge amount of time required to commit to their not inconsiderable needs. In an only-dog situation, you will become your dog’s pack and he or she will want to do everything they can with you. You will need to entertain him/her as otherwise he/she will become bored and potentially extremely destructive. Prey drive (which may include small pets such as cats or rabbits…) varies from dog to dog depending on which breeds have been added into their makeup. If you find you have a puppy with higher prey drive, then we suggest plenty of training on a long line lead and that you do not let your dog off lead if it is anywhere near animals unless you have full control with recall. As with many double coated breeds, Wolfalikes moult twice a year, usually in Spring and Autumn. During their moults, their soft undercoat will fall out gently and painlessly in tufts for weeks. This process is known as “blowing their coat”. At this time, they will need brushing around 3 times a day. Your house will resemble a snow storm and you will have tumbleweeds of fur rolling around, so investing in a good vacuum cleaner is a must. Sometimes you will wonder where all the fur has come from – it seems impossible that one dog can be hiding so much. Occasionally they will also lose their guard hairs (top coat) and when they do, they tend to look very untidy and unkempt until their full coat grows back. When they have finished moulting, daily grooming of Wolfalikes is good practice as it keeps them clean and knot free. It also gives you chance to check for lumps, bumps and any injuries or ticks they may have picked up on a walk. As puppies, Wolfalikes are very quick to learn and willing to please. It is recommended that as soon as they are allowed out in public, you should take them along to an approved training school where they can begin to learn not only some basic manners, but also how to mix with other breeds. Some puppies can be very outgoing and bold, whilst others are more reserved and need extra coaxing to join in. Wolfalike dogs need plenty of early socialisation and positive training experiences as they grow. They can be very stubborn at times as they get older, so extra encouragement and patience is needed. They do go through different life stages, just like human beings, and if they are left untrained, habits formed at these times can cause issues as the dogs grow into adulthood. If you start from an early age, most Wolfalike dogs can be successfully let off lead, and with plenty of training will come back to their owner on command. Training is a lifetime commitment with a Wolfalike dog. As with any large breed dog, care should be taken with the amount of on lead exercise you give a puppy. A good rule of thumb is a ratio of five minutes exercise per month of age (up to twice a day) until the puppy is fully grown, i.e. 15 minutes (up to twice a day). When three months old, 20 minutes when four months old etc. Once they are fully grown, they can go out for much longer. As Wolfalikes are a large or Giant breed you really need to be cautious with what you allow them to do at a young age, absolutely no agility, mushing or continuous running until they are past 18 months old, an then it will depend on how the growth of each individual dog is going. Wolfalike Dogs love to be part of the family and cuddle up on the sofa with you, just remember when allowing that cute 10kg puppy up on the sofa or your bed for cuddles, that that 55kg Adult will also still think its ok to come up for cuddles, set boundaries from the start. A safe area for when you are out is great to have, as they can get up to mischief as soon as they know you are not around. Crate Training is a sensible thing to do with these dogs if done correctly as it keeps them safe and out of harm’s way. Some Wolfalikes prefer to be cooler and may want the door open to the outside all day, a nice outdoor area is always a good idea, where they can be dry but still lay out in the fresh air. A fair size garden is idea for these dogs, remember to check you have no plants that are poisonous to dogs, as Wolfalikes do like to help with the gardening. A secure Garden with a 6-foot fence is a must with these dogs, as some can be climbers or jumpers.